It seems like night after night I just don't get a solid nights sleep. There are many contributing factors to my sleepless nights some of which include reading to late, watching to much TV and my main contributor right now seems to be that dreaded change in life. UGH! I have no decided to do a night time routine that includes unwinding from my busy day schedule. I have established a regular bedtime. It really does wonders to get your body in line with a regular routine. I have also added some comfy pillows to be lovely new bed - yes my mattress and boxspring were recently purchased and I have to say that helps contribute to a good nights sleep. I know that isn't an option for everyone but even making your bed comfy with a nice pillow will help. Last but not least I have added soothing fragrances to my night time routine. 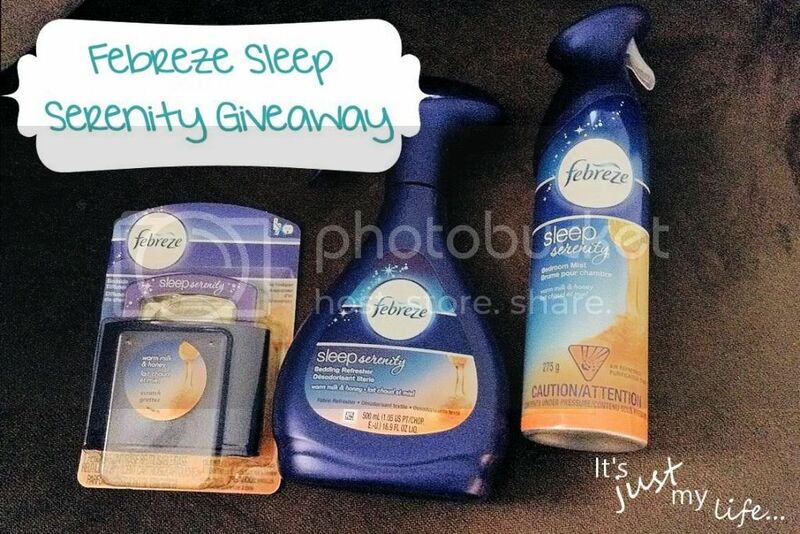 I am not a big fan of scents of any kind but I really love the Febreze Sleep Serenity Collection - Warm Milk & Honey is my favourite!!!! Get a free sample size of one of three new scents: Moonlit Lavender, Warm Milk & Honey and Quiet Jasmine! Go HERE to get the sample.